Most of the time, brief bouts of spring and summer rain are a welcome break. After all, plants, animals and humans all need water to survive. But with too much rain comes flooding, which can be a huge problem. A sudden buildup of fast-flowing water can be dangerous for many reasons, with drowning the biggest concern. More than 125 people died from flooding in the U.S. in 2016, so it’s important to take caution and never drive or walk through floodwaters. 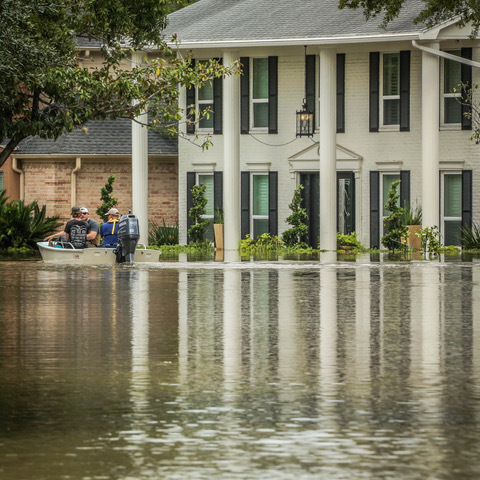 What’s in floodwaters can also be harmful to your health. Chemicals, sewage and other dangers can be present. When dealing with floodwater, wear protective clothing like masks, rubber gloves and boots. If you have a cut or rash, keep it covered with a waterproof bandage. Clean your skin well with soap and water. The dangers don’t end when floodwaters recede. That’s because flooding can leave behind pools of water. These are perfect places for mosquitoes to lay their eggs. Empty and scrub things that hold water in your yard or neighborhood, such as buckets, planters, toys, birdbaths and trash containers. If you have water that can’t be dumped, consider using mosquito larvicide. Floodwater in homes can also lead to mold. Mold can cause breathing problems, especially in kids and seniors. To protect yourself, clean and dry your home as soon as you can. Air out buildings by opening windows and running fans. Clean surfaces with hot water and soap. Throw away wet food, medicine or anything else you can’t clean or dry quickly. Remember the rule: When in doubt, throw it out! Clean up any mold you find with a mix of bleach and water. Again, make sure you have protection, such as gloves, boots and masks. It’s also a good idea to make sure that your home is ready for flooding year-round. 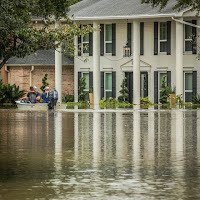 A good first step is to buy flood insurance. Next, put together an evacuation plan and discuss it with your family. Make sure you’re stocked up on food and supplies and have them ready to go if you need to evacuate. By being ready for flooding before and after a storm, you can make sure you and your home stay safe and healthy. Check out our Get Ready fact sheet for more tips. Child care centers and flu: Are they prepared? Child care centers do lots of things to make sure the kids they watch over are protected. Safe play spaces, healthy food and an attentive adult eye are common features. But when it comes to a serious, widespread outbreak of flu, child care centers may not be so prepared, scientists found recently. 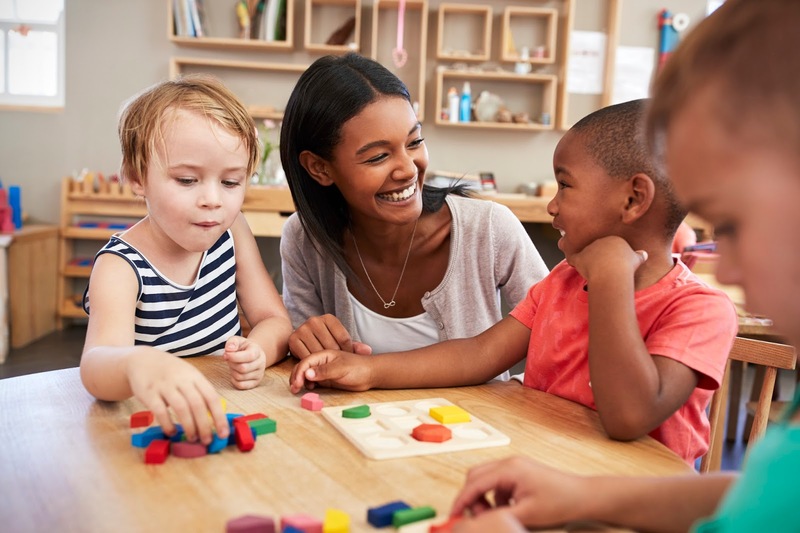 In a study published last year, researchers surveyed more than 1,000 child care center directors about practices such as infection control, communication, immunization and health care training. Unfortunately, the study found readiness was low: Only 7 percent of directors had taken actions to prepare their centers for a pandemic flu outbreak. The study looked at pandemic flu in particular because it has the potential to be very dangerous, especially for young children — the main users of child care centers. Pandemic flu is different than seasonal flu for a few reasons: It’s easily spread, it’s a new type of flu most people don’t have immunity to and there won’t be a vaccine. And as the name implies, it’s happening around the world, meaning lots of cases. Child care centers can be doing more to protect kids from the flu, the researchers said. Directors should be trained by licensed professionals, such as health consultants, to educate staff on health and safety issues. That will help to increase awareness and knowledge of the flu pandemic. Parents should also be actively involved. Ask questions. Learn how your child care center is taking action in preventing the spread of the flu. That’s important whether there is a flu pandemic or if it’s just a regular flu season. There are also lots of ways that you can protect your child from the flu beyond the child care center. Remember, an annual flu vaccination is the best way to prevent your child from flu. Feeling stressed? You’re not alone. Eighty percent of Americans report at least one symptom of stress a month. And with Tax Day just around the corner, a lot of people are feeling some big-time stress right now. It makes sense that April 16 is National Stress Awareness Day, a time for people to assess their stress and make plans to address it. Luckily, planning for disasters is one thing that doesn’t have to be stressful. More planning means less stress when an emergency occurs. Step 1: Know the risks in your area. There is no such thing as a one-size-fits-all approach when it comes to preparedness. Different regions have different risks. If you live in southern California, it makes sense to be more prepared for earthquakes and wildfires than snowstorms. You never know what might happen, though, so sign up for emergency alerts to be notified when an emergency happens. Step 2: Make an emergency plan for your household. Be sure everyone knows what to do, where to go and how to get in touch with each other during an emergency. It’s also a good idea to work together with members of your community. Step 3: Assemble your emergency supplies. Think about your family’s specific needs and plan accordingly. You know you’ll need food, water and first-aid supplies, but don’t forget extra litter for kitty, hearing aid batteries for grandma or allergy meds for junior. Also, be sure and create a “go-bag” that you can easily grab in a hurry. Step 4: Practice! Make sure you know your evacuation routes, the locations of all your supplies and your emergency meeting locations. Four steps later and you’re a pro! Being prepared for a disaster can help lower stress during a high-intensity time. After all, protecting your mental health is good for preparedness. Check out the Get Ready site for even more easy planning materials. Get your party hats on, because it’s National Public Health Week! This year, APHA is using April 2-8 to highlight issues that are important to the nation’s health. 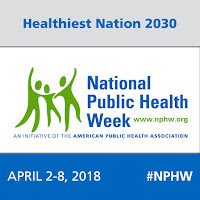 NPHW is a week filled with fun and exciting educational activities. It’s the perfect opportunity for you to share information on preparedness so that you and your community will be ready to tackle any unexpected disaster! After all, a prepared community is a healthy community. Monday, April 2: Behavioral health. About 1 in 5 U.S. adults have a mental illness. Share information about mental health and disasters from Get Ready. Tuesday, April 3: Communicable diseases. Get Ready has great materials to share on this topic, including fact sheets on flu, Zika, dengue and Ebola. They’re perfect for passing out at your community or campus health fair. Wednesday, April 4: Environmental health. Help maintain a healthy planet and protect human health. Our heat waves and floods fact sheets can raise awareness of threats. Thursday, April 5: Injury and violence prevention. Preventable unintentional injuries are among the leading causes of death in the U.S. Learn about policies and safety measures that can be taken to reduce them. Friday, April 6: Ensuring the right to health. Everyone deserves the right to live, learn, work, worship and play in a healthy environment, free from preventable disease and disability. No time to plan an event? No problem! Anyone can show their support for National Public Health Week. It can be as simple as sharing a post on Facebook or Twitter, or hanging information on your workplace bulletin board or fridge. 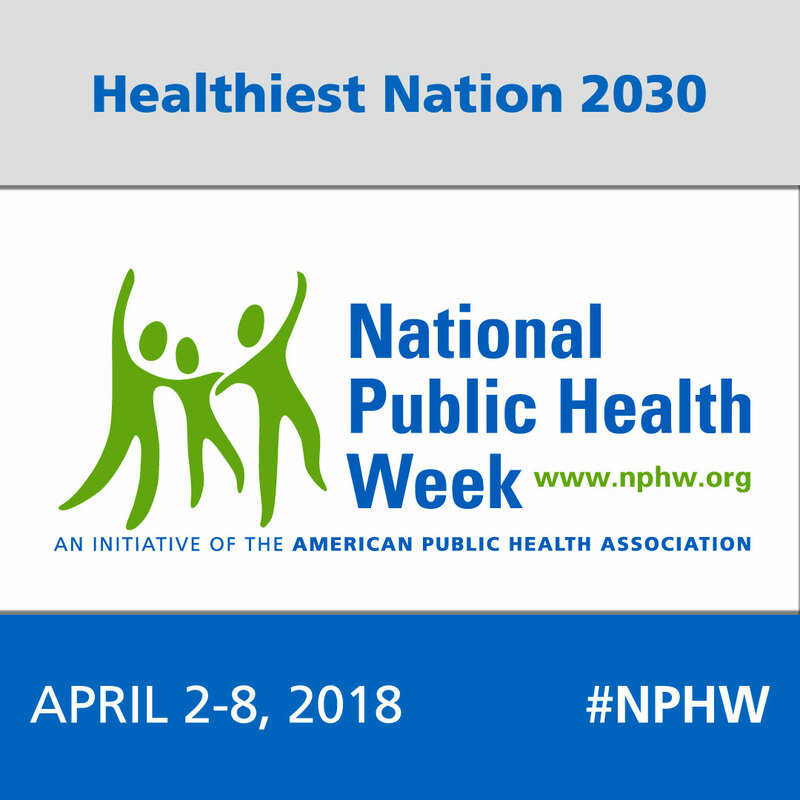 For more ideas on how you can get involved, check out APHA’s NPHW page.